Pico Technology and SysManSMS combine to take advantage of the multiple sensor options of the DrDAQ data logging device and the ubiquity of the mobile phone. This combination provides a cost–effective, easy–to–install solution to a broad range of problems wherever there is a need to make someone who is mobile aware of an environment change and allow them to take action to address that change remotely. For use with the DrDAQ sensor module the SysManSMS Server is the middleware between the environment sensors and the outside mobile world. SysMan was developed in Norway and runs on a Windows–based PC. It needs Windows NT, 2000 or XP as it’s operating environment as it runs constantly as a Microsoft service meaning that as long as the PC remains alive so does SysMan Server. The server connects to the DrDAQ sensors by means of the SysMan Hclient. The Hclient can be considered to be the interface software that collects the alerts generated by DrDAQ and passes them to the SysMan Server. The server then translates those alerts to SMS text messages and sends them to a pre-defined mobile number directly across the GSM network. On receipt of the SMS message on a mobile phone, the recipient can then decide on a course of action, enter this on their phone, again as a standard SMS text message and send it back to the SysMan Server. As the server is constantly running as a background service it is not only scanning for alerts from the DrDAQ modules but will also immediately pick up any incoming SMS text messages. When an incoming message is detected SysMan Server checks the message format and if that message contains an allowed executable that process is started. This is, of course, only permitted for pre–determined authorized users. One further point worth noting is that the SysMan Hclient enables an authorised user to send a system status request at any time. SysMan will then automatically return the current status and setting of all existing DrDAQ sensors. To summarise, from an initial alert generated by the DrDAQ sensor, through letting someone know there is a problem to an action to resolve that problem, the complete process takes place using only standard SMS text messages, the existing GSM network (totally independent of operator) and a mobile phone. The temperature sensor was used in one particularly interesting case by Statoil who supply water to a fish farm on the west coast of Norway. The problem to be resolved was that if the temperature of the water dropped too low the fish would lie on the bottom of the tanks and block the water outlets. This led to water overflowing from the tanks. The solution to the problem was to monitor the temperature of the water using the DrDAQ module. If the temperature drops below a certain level the alert goes via the SysMan Hclient and arrives as an SMS text message on the mobile phone of the engineer who can then fix the problem. SysMan is designed so that if the SMS cannot be delivered to the first choice of mobile number, perhaps because that phone is switched off or out of range, then a failed delivery can automatically trigger a cascade to a backup number. If this fails, it then goes to the next one and so on until a successful delivery is made. 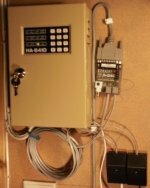 An interesting variation on the use of the DrDAQ sensors in a computer room is by three of our existing users utilising the sound sensor to detect if the background level changes. In these cases they are looking for a drop in the sound level if a cooling fan stops working. Using alternative solutions to this particular problem is difficult and complex, needing many sensors of different kinds linked by cable to each individual fan. The combined use of DrDAQ and SysMan provides a simple, elegant solution to the problem. This particular problem is also a prime example of where SysMans ability to send back executable commands as SMS text messages is used. In these cases the command to either start auxiliary cooling fans is sent back from the mobile phone or a command is issued to safely shut down the system before overheating occurs. One user of this combination has a very secure cable connection rack. This customer wanted to know, via an SMS to his phone, if someone opened the rack. The solution was to mount a DrDAQ in the rack and activate the light sensor. As someone opens the door, light enters and an SMS alarm goes out immediately. In a similar way, another user wanted to be alerted if someone entered the secure computer room. Normally the door would be closed and the room left in darkness. However, if someone opened the door again the light would automatically go on. By mounting a DrDAQ inside the computer room in the same way as soon as the light goes on an SMS is sent. The reed switch sensor is probably the most flexible of all of the DrDAQ sensor options and is frequently used where a custom solution is needed. One particular example of this is where a customer has various UPS (Uninterrupted Power Supply) systems for their computers. This obviously solves his immediate problem of protecting the computer network in the event of a power failure but they had no way of knowing when the mains power had failed! Due to the numerous UPS systems, interfacing to them all and monitoring each one was going to be a costly and complex issue. Here, a 9 v power supply was connected to the common 220 v supply outside the UPS. The 9 v is fed to a relay and into the reed switch sensor. As the 220 v supply goes out so the SMS is generated informing the customer and similarly, when it comes back on, so is another. Due to the multiple sensor capability of the DrDAQ module, the situations where it can be used to pick up change are virtually limitless. This, combined with the ability of SysMan to convert and send those alerts as standard SMS text, provide a cost-effective, reliable solution to many diverse problems as we have demonstrated in the examples above. This application note was submitted by Kevin Long, Managing Director of Lonsco Limited - the sole UK distributor for the SysMan server.